What if I told you that tonight you could have a steak dinner? Not just any old steak, but a cheap cut of steak that would magically be as tender as a high-end A5 grade wagyu beef steak? Think about that for a moment. 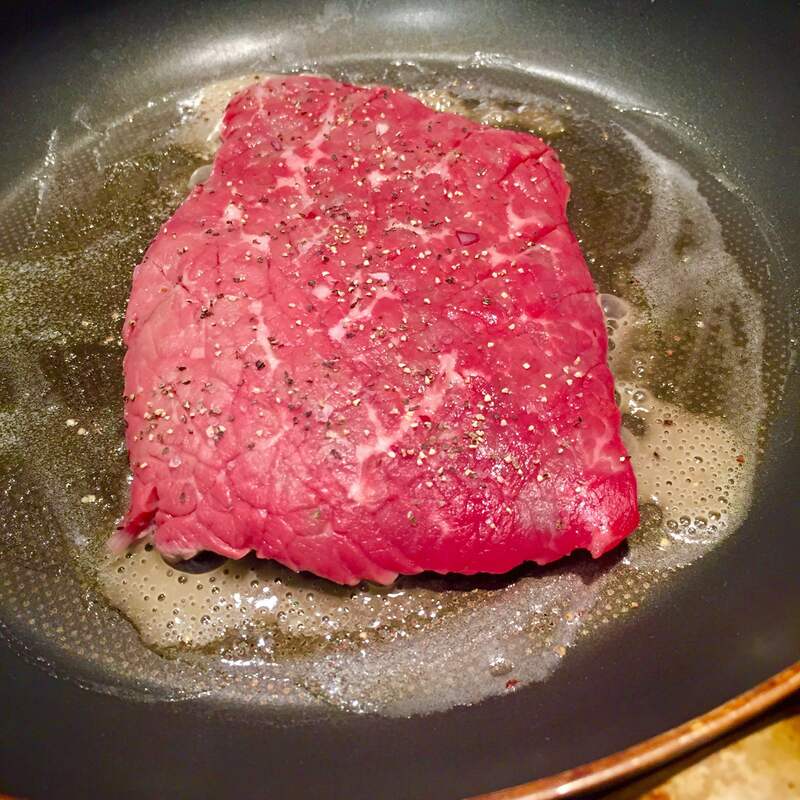 I’m going to give you a recipe that transforms a $2.50 steak into something so tender that it costs $60 a pound. Sounds crazy, right? Enter, the promise of the Chaliapin Steak. I have a superpower. I’ve had it for as long as I can remember. It may be the result of being an only child; it may be something that’s been passed down to me by my parents (who both happen to social ninja); it may be the result of nearly being electrocuted as a child. I don’t know for sure where it comes from. All I know is that it’s a power, and it’s super. And it’s there. But back to the story at hand. 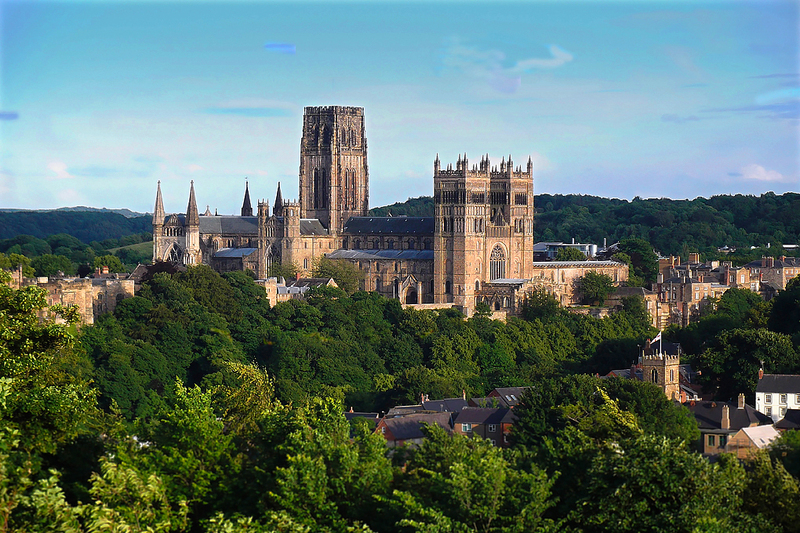 I studied at Durham University, it’s in North-east England, and is one of the locations that Harry Potter movies were filmed (I literally studied at Hogwarts… told ya I was special!). It’s truly a gorgeous location. However, it was also on the opposite side of the country to anyone I knew! Not a bad place to spend five years! Getting to know people isn’t the easiest thing in the world for me, so I retreated to doing what I do best – making people want to cook me dinner. There was one person that stood out when cooking me dinner though, and that was my friend Peas. Unlike everyone else who’d cook and let me know when to be over for eat, Peas took me shopping, and then insisted (often with a swift stomp of her foot!) that I stand by the stove and watch as she cooked dinner. She’d decided to teach me how to cook, whether I wanted to learn or not! It was certainly a worthwhile endeavour, and over our many meals together we became very close friends. 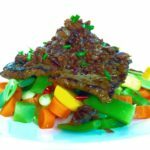 The last meal she cooked for me was a simple steak and vegetables dinner, I still recall us bursting into laughter when I took a bite of the vegetables and said “Mmm…. broccoli!” – I wasn’t a big fan of vegetables back then. So when I was watching Shokugeki no Soma (a Japanese anime centred around high school kids in a prestigious culinary academy… It’s hilarious, don’t let your kids watch it.) some time back, and the main character Soma chose to prepare a Chaliapin Steak in a food battle, I knew instantly that I’d try to replicate the recipe at home afterwards. My very own Ode to Peas (except there are no peas in this dish, but there could be if you wanted! ), if you will. 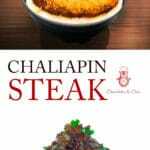 What is a Chaliapin Steak? What is a Chaliapin Steak, you ask? Well, as the story goes… in 1936, Russian opera singer Feodor Chaliapin was staying at the Imperial Hotel in Japan. One day, while suffering from a toothache, he requested an extra tender steak, and the Chaliapin Steak is what the chef came up with! Now, while the anime uses this dish to pit a discounted steak against top quality meat, I’m going to recommend you use the best cut of steak you can afford (a boneless one). I used a $2.50 round cut to test whether my version of the dish works… (SPOILER: It does.). 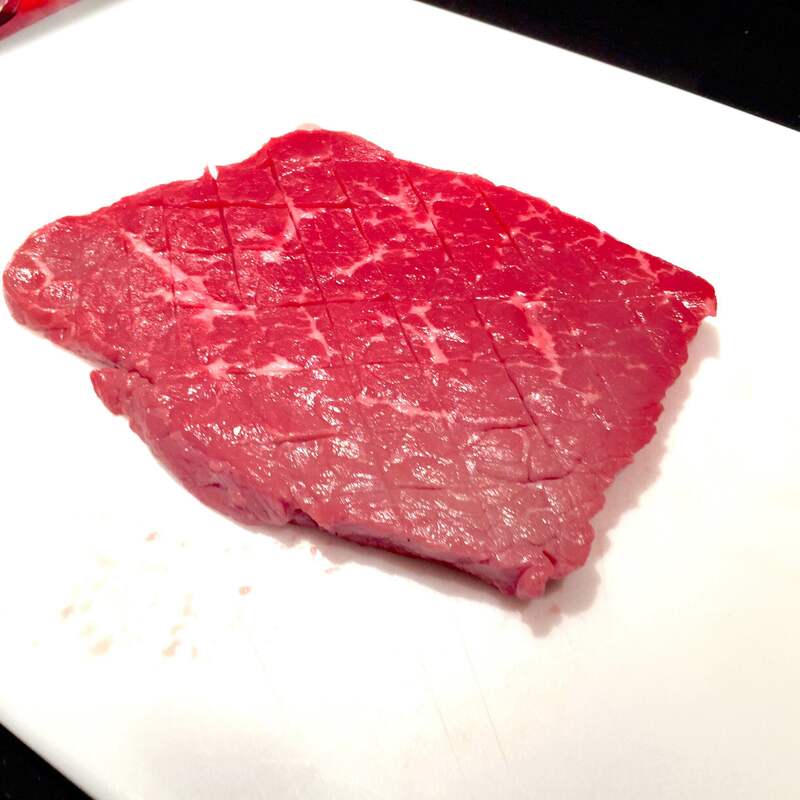 My take on the Chaliapin Steak recipe presented in Shokugeki no Soma – quick, easy, cheap (!) and delicious! Score your steaks with a grid pattern. Use a meat tenderiser or the back of a heavy knife to tenderise your steaks – make sure to give them a few good thwacks! 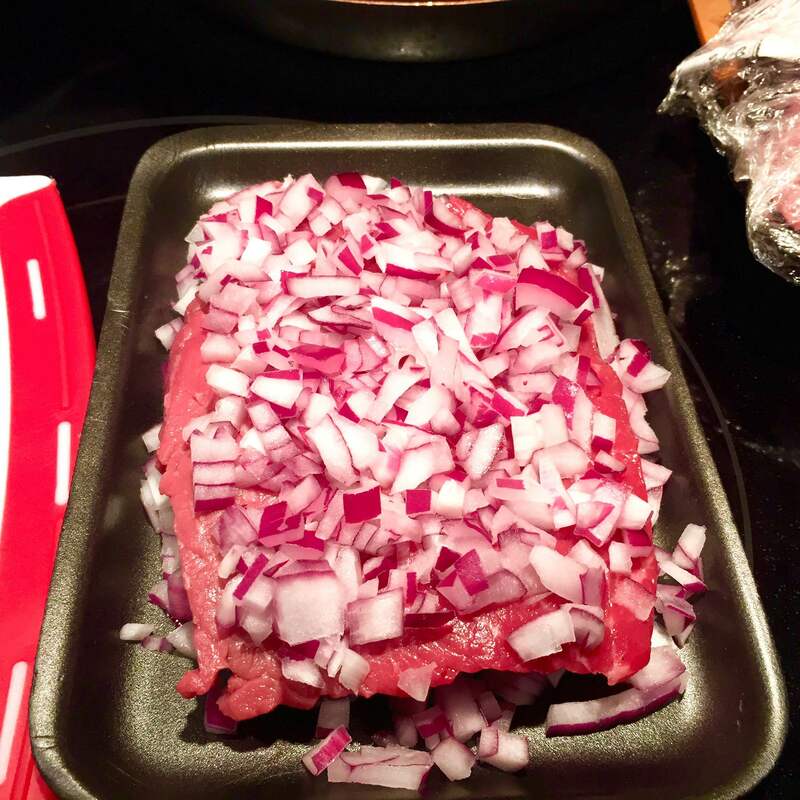 Cover the top and the bottom of the steaks using the chopped onions. Cover with cling film, and let them rest for 30-45 minutes. Remove the onions from the steak; season and cook the steaks. Remove steaks and lay to rest when done. Do not clean the pan once the steaks are done. In the same pan, cook onions with 1 tbsp butter. 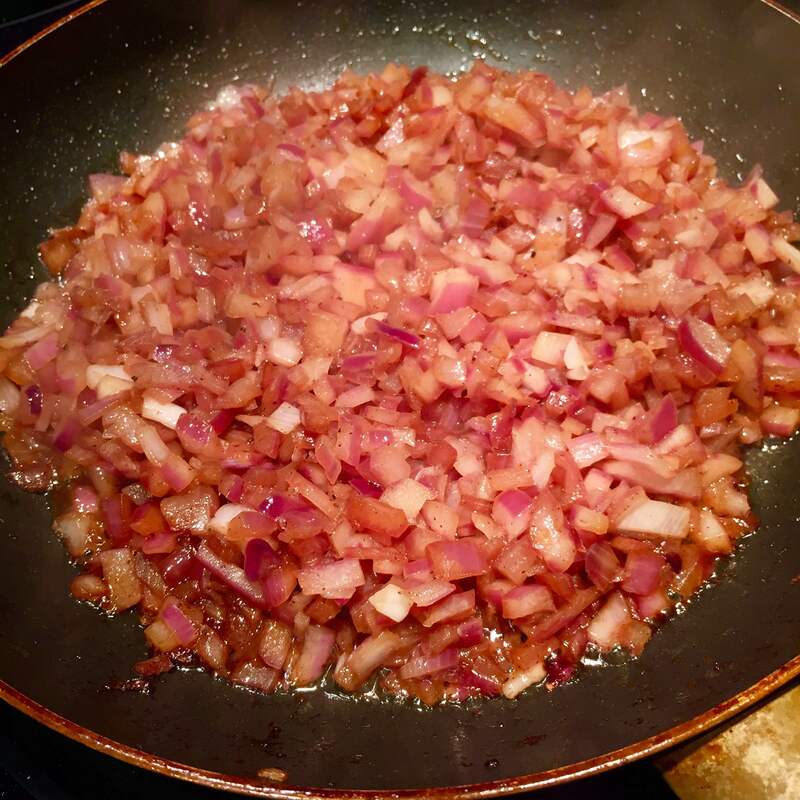 Cook over a medium heat until onions are browning. Add soy sauce, sriracha, balsamic vinegar, and honey; mix well. Cook until onions are completely browned and softened (Congratulations! You’ve just caramelised onions!). Spread caramelised onions over the steak, and garnish with chives. In the anime, the steak is served with pickled plum rice. I’ve opted to go with a pack of “Parisian-style Vegetables”. Potato starch is added to the onions while they’re being cooked as well, do this if you want to thicken your sauce! Pair the steak with whatever your heart desires. Except, toffee. Never pair steak and toffee together. 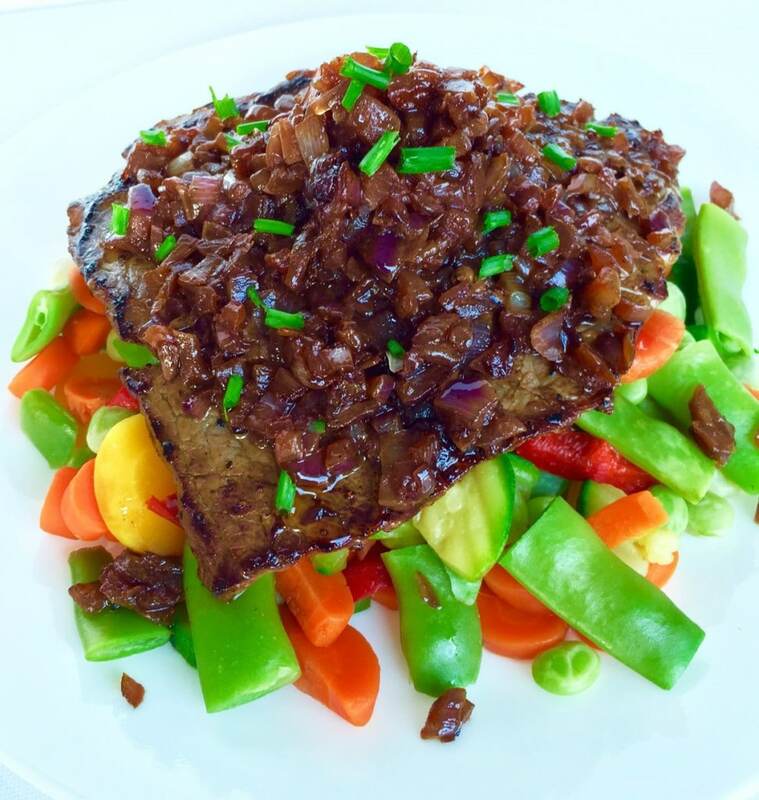 What do you think of the Chaliapin Steak? I personally love it. It’s quick, easy, (cheap!) and delicious! Have you watched Shokugeki no Soma? Do the very vivid reactions to food make you laugh out loud, while at the same time, quickly spinning your head around to see who else can see what’s happening on your screen? 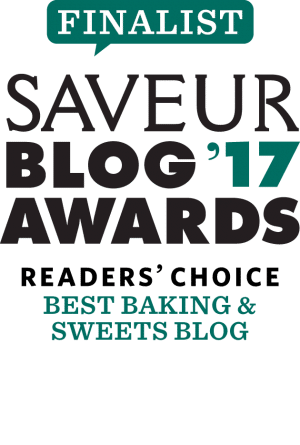 Do you have a favourite recipe from the show? Heck, tell me who taught you how to cook! Comment below, let me know! Please do share this recipe and follow me on social media! Facebook, Pinterest, Instagram, good ol’ fashioned Twitter… it’s all good! Yes, yes, yes! Oh my god, someone else who just gets it! And yours looks even better than mine, too. I just wish the boyfriend would have let me make it according to the recipe in the manga. Oh well. I know I’m planning a few more dishes from Shokugeki no Soma, how about you? So far we’ve made this like six times, but I want to do the transforming furikaki next. Thanks Leisel! I’ve actually fallen quite behind on the series itself but I intend to have a mega Crunchy Roll session and catch up soon! Will very likely try out some of the other recipes! This looks great but for one problem, I can’t find Sriracha sauce in my country, what can I use instead? You can make this without the sriracha sauce (that’s an addition I made to the traditional recipe) – but if you’d like just a little zing to your dish, you can add piri piri or any hot picante sauce. If you’re looking for a more Japanese spice, you can try mixing yuzu with a little chilli and salt. The onions you cooked after the steak. Are thet the same ones that you used to tenderize the meat? hi riz, i really like steak, maybe i will try in the weekend later. Hi there! Hope you enjoy it! I have to show this steak to my husband, he will love it (and make it!). 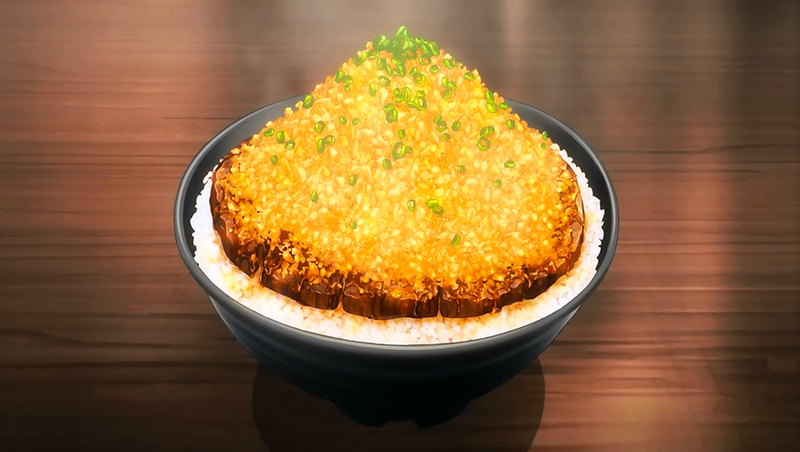 I didn’t know Chaliapin Steak until this very moment and I’ve never watched Shokugeki no Soma (but I’d like to!). P.s. Great place to study! I hope you guys enjoy it! Shokugeki no Soma is a fun watch…I actually should catch up on its second season! I love your posts as I always learn something new! I tried this for dinner yesterday! It’s my favourite version!! Thank you! My gf even said I should go to culinary school! Hey there! The soy sauce and balsamic vinegar are there to add/enhance flavour. How long would you recommend cooking the steaks and at what temperature? For seasoning the steaks, would you just recommend rubbing some salt, black pepper, and paprika into them? Thanks! Hey Luke! The time and temperature will depend on a lot of things – the cut and size/shape of your steak, the level of done-ness you prefer, and your heating element. So unfortunately, I can’t say offhand how long to cook them. For my personal preference, I like my steak cooked medium (which is usually an internal temp of around 150-160 degrees F).